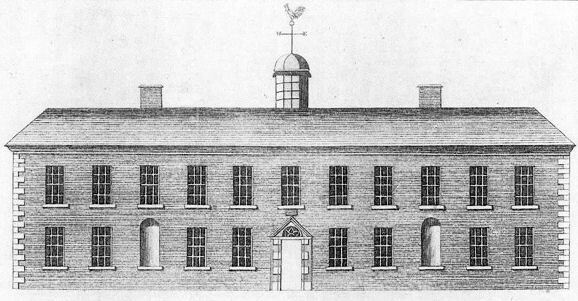 Limerick erected a House of Industry in 1774 on land donated by a local bishop, located on what is now Clancy Strand. Its consruction, which cost £500, was funded by Grand Jury presentments (local taxes) on the county and city, together with a bequest of £200 by from a Dr. Edward Smyth, of Dublin, towards providing thirteen cells for the insane. The building, designed by a local minister, the Rev. Deane Hoare, was in the form of a large square with sixteen large rooms with an infirmary in its garden. The establshment was initially intended to accommodate 200 inmates although this later increased to 380. In 1823, a wing was added to accommodate seventy infirm women and two work-rooms for spinners and weavers. 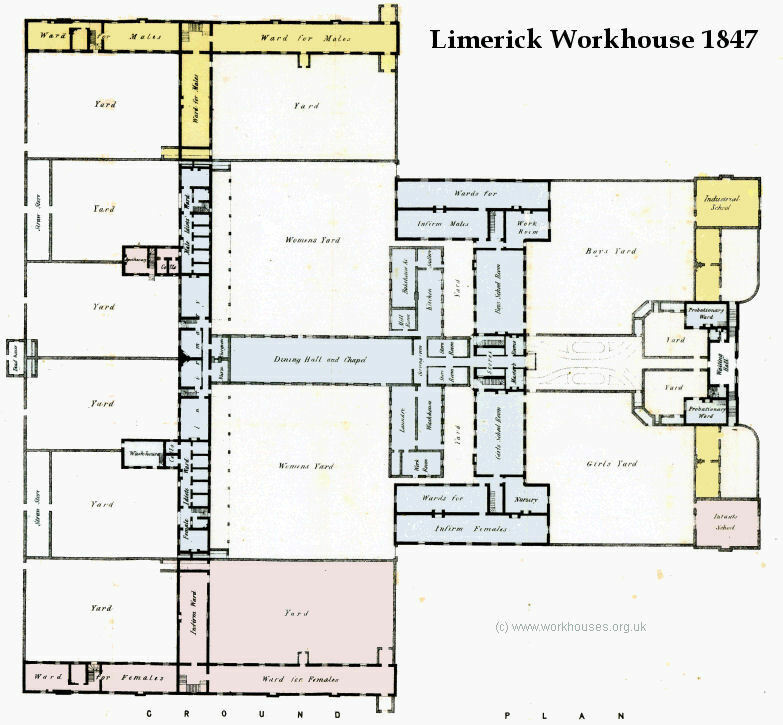 The Limerick House of Industry comprehends four distinct establishments: it is not only an asylum for paupers and vagrants, but a nursery-school for deserted children, a Lock Hospital, and a retreat for Lunatics. There are at this day 255 persons in the house, of which fifty-eight are infirm and sick, forty-four lunatics, and seventy-seven children. The lunatic departments consists of thirteen cells, in which nineteen unhappy creatures are confined, and whose covering is five pairs and a half of blankets, and one pair of sheets. There are 106 beds in the different wards, sixteen of which are occupied by single persons, whose infirmity renders it inadmissable that a second person should be with them, leaving ninety beds for the accommodation of 220 persons; the inmates are subsisted at the expense of 2½d. a head. Co. Limerick: Abington (2), Ballybricken, Caherconlish, Cappamore, Castleconnell, Crecora, Doon, Fedamore, Kilmurry, County of City of Limerick (20), Murroe, Patrickswell. Co. Clare: Kilfenaghta, Killeely (2), Killokennedy (2), Kilseely, Kiltannonlea. Later Additions: Ballycannon, Ballycummin, Ballyglass, Ballyvarra, Caherelly, Cappavilla, Castlecrine, Cloghera, Cloontra, Carrig, Clarina, Clonkeen, Cratloe, Fahymore, Glenstal, Lackareagh, Mountievers, O'Briensbridge, Roxborough. The Board also included 13 ex-officio Guardians, making a total of 53. The Guardians met each week on Wednesday at noon. The population falling within the Union at the 1831 census had been 140,072 with divisions ranging in size from Doon (population 790) to Limerick City (66,554). The new workhouse, built in 1839-41, was designed by George Wilkinson on an 11-acre site on the east side of Shelbourne Road, across the Shannon to the north-west of the city. It was designed to hold 1,600 inmates, cost £10,000 plus £2,830 for fixtures and fittings etc. It was declared fit for the admission of paupers on 20th May 1841 and admitted its first inmates two days later. The site location and layout are shown on the 1925 map below. The workhouse came under great pressure during the famine years of 1846-48. New buildings and temporary sheds were erected to accommodate an extra 912 inmates. An architect's bird's-eye view plan shows the extended buildings. A ground-plan of 1847 shows the original buildings (in blue), extensions already completed (in pink), and still to be erected (in yellow). The entrance block at the front of the site housed the board room and receiving-rooms. The extensions added an industrial training school on the boys' side and an infants' school on the girls' side. Limerick entrance block from the south-east with infants' school at left, 2000. 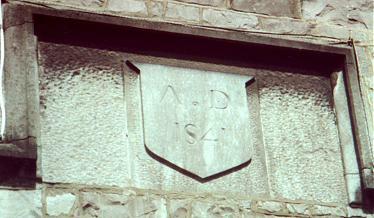 Limerick entrance date stone, 2000. The central range (now largely gone) housed dormitories, school rooms, day rooms, kitchen and food serving rooms. The rearmost range, linked via a single-storey central spine containing dining hall and chapel, housed the workhouse infirmary and idiots' wards. Limerick central and infirmary ranges, 2000. Additional hospital blocks were later erected at the rear of the site. Limerick hospital block from the north-east, 2000. In January 1861, the quality of medical care in the workhouse had become a cause for concern to the Guardians, with the 400 inmates in the hospital section being looked after by three nurses assisted by 36 pauper attendants, and no matron to supervise their work. 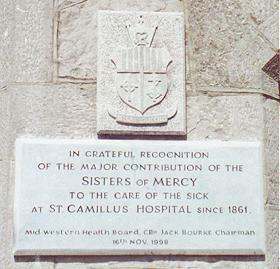 Following a recommendation from the Guardians, which was initially resisted by the Poor Law Commissioners, Limerick became the first workhouse to employ Sisters of Mercy, a religious order dedicated to the relief of the sick poor through their training as nurses. Sisters of Mercy were subsequently in many other workhouses, often becoming matrons, a role that continues to the present day. At the 1901 census, the population of the Union was 66,014 with 65 officials and 1,140 inmates in the workhouse. 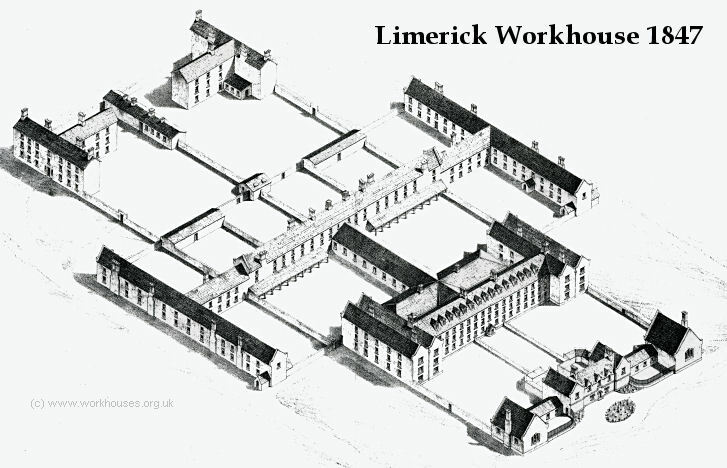 The former Limerick workhouse is now St Camillus's Hospital. Limerick Guardians' Minute books online.